For over two decades, J.F.D. Tube & Coil Products, Inc. has been providing OEM, direct replacement, and new application fin coils. 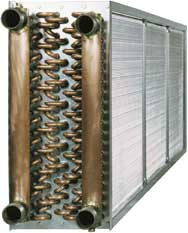 With coils ranging from small boosters for HVAC, or large custom process coils, J.F.D. can supply a coil to meet your needs. J.F.D. standard fin coils ship 4-5 weeks after receipt of purchase order and final drawing approval. A J.F.D. representative can measure your existing coil in the Tri-State / New England areas. Other areas, please use our fill-in data sheets, which can be found by clicking the link below. RUSH / EMERGENCY SHIPMENTS are available for new fin coils. Contact us today for a quote or more information about our fin coils. Not Sure How to Measure a Fin Coil? Check out our online/printable fin coil dimension sheets!